← And Why WOULDN’T You Make a Portrait of Louis CK out of Cheetos? Look at that kid’s face. That is the look of pure joy. I tweeted this out last night, but I know a lot of you lobsters aren’t on the twit machine. 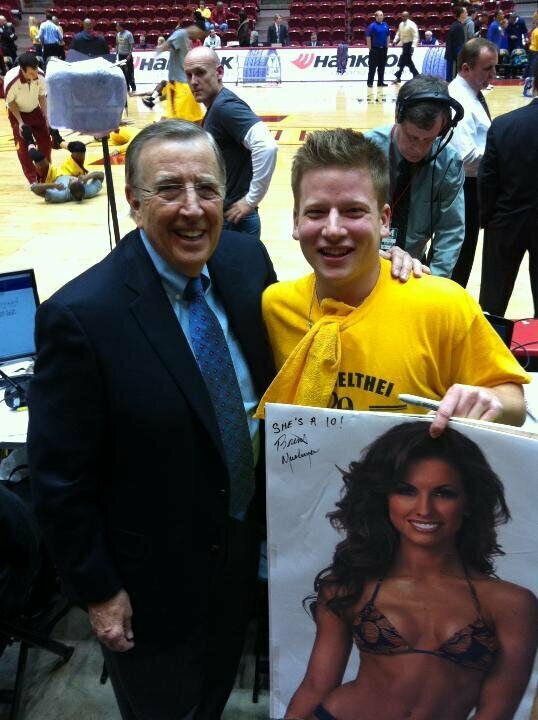 Musburger called the Iowa State game last night, and a fan got him to sign a poster of Katherine Webb in a bikini… “She’s a 10!” — I love it. Brent just continues to give ESPN the finger for their apology. Somewhere, Jen Sterger is smiling… or jealous. This entry was posted in Basketball, Celebrities and tagged Brent Musburger, Brent Musburger She's a 10!, Brent Musburger webb, katherine webb. Bookmark the permalink.